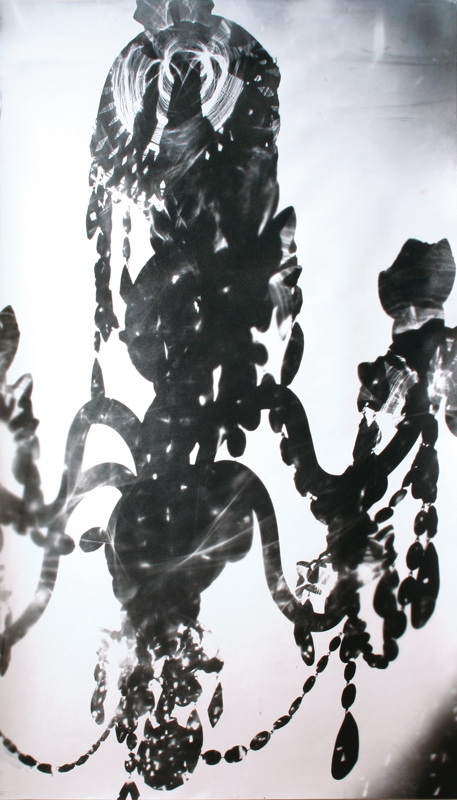 This new project (2010-) combines the theatrical, alchemical processes developed in the Optic and Cut Glass series with camera obscura, digital scanning, rendering and printing techniques to create a new kind of photographic Trompe l’oiel. Choreographing a range of different exposures around the chosen spaces and activities, Murphy will montage the shadows of a range of objects and architectural features into a series of evocative panoramas. These may form a unique record and ‘optical’ interpretation of the chosen interior or exterior space. Responding to a wide range of possible histories, behaviours and architectures, this project will combine some elemental alchemical photographic processes with new digital imaging techniques to create an entirely new hybrid illusion. Referencing the oldest photographic negative in existence – the latticed window in Lacock Abbey in 1835 by Fox Talbot, these installations may include renderings of windows, alcoves stairwells and cupboards, historic props as well actors/participants may be exposed or employed to assemble dramatic panoramas that respond to or intervene in the building’s structure. Mounted directly onto the walls, these panoramas may be developed to respond to specific spaces or historic legacies – using subtle plays of light and shadow to create the illusion of objects no longer present, such as the ‘ghost’ chandelier raking across a ceiling or down a stairwell – or a whole illusory chamber of luminosity, refraction or shadow.